Last spring, former senator Matt Dunne seemed to be one of the few Democrats ready and willing to challenge Gov. Peter Shumlin for the state's top office. The Hartland resident and Google exec spent months courting political insiders over coffee and showed up at the Statehouse conspicuously often for a guy who hadn't served in the building for nearly a decade. In a June interview with Seven Days — a week before Shumlin announced his plans to retire — Dunne pointedly declined to say whether he'd support the governor's reelection. Now that Shummy's out, Dunne still seems to be running against the leader of his own party. On VPR's "Vermont Edition" last week, the 45-year-old gubernatorial candidate repeatedly argued that the state's economy "is not working" for Vermonters and said he'd "bring new management to state government that I think we can all agree we could use right now." In a follow-up interview with Seven Days, Dunne added, "I think it's safe to say that there have been examples of where not having the kind of experience that I have — and people that I would pull into an administration would have — has led to some problems." "I think the most obvious example is the exchange website," he said, referring to Vermont Health Connect. "Peter Shumlin has lots of experience that I would not bring to the governor's office — but I have a different set of experiences." While Dunne's anti-Shumlin strategy might disappoint die-hard Dems, it should help him in the general election to defuse GOP attempts to tie him to an unpopular incumbent. More immediately, it's a way to differentiate himself from his two Democratic primary opponents: former transportation secretary Sue Minter, who served in the Shumlin administration; and House Speaker Shap Smith, who helped pass key portions of Shumlin's agenda. Case in point: education reform. Aside from health care, the most divisive issue in Vermont right now appears to be Act 46, the education governance overhaul currently dominating school board agendas throughout the state. Smith and Shumlin fought to pass it legislative session — and Dunne is dead set against it. "It's really not working," Dunne told VPR, calling it "an unfortunate piece of legislation passed with the very best intentions." Pitched as a way to address rising property taxes and declining school enrollment, Act 46 provides incentives for the state's tiny, overlapping school districts to merge, starting next summer, and forces most to do so by 2019. Proponents say it'll eventually slow the growth of education spending by making it easier for neighboring towns to share resources — and, though nobody wants to say it, by closing schools. In the meantime, the law sets a variable cap on per-pupil spending increases for two years, in an effort to provide immediate tax relief. Dunne criticizes the law as "just too aggressive." He says it's forcing communities to make "unbelievably fast" decisions about the future of their schools in order to create districts with at least 900 students — a number Dunne calls "arbitrary." He worries the temporary spending caps will hurt Vermont's smallest school districts, whose per-pupil expenses can skyrocket as a result of losing just a few kids. So what does that say about Speaker Smith, the guy who staked his reputation on the law's passage? "What I heard from the speaker was that at one point he hoped it would decrease property taxes and at a different point this was an effort to make sure towns would have higher-quality education for their kids," Dunne says. 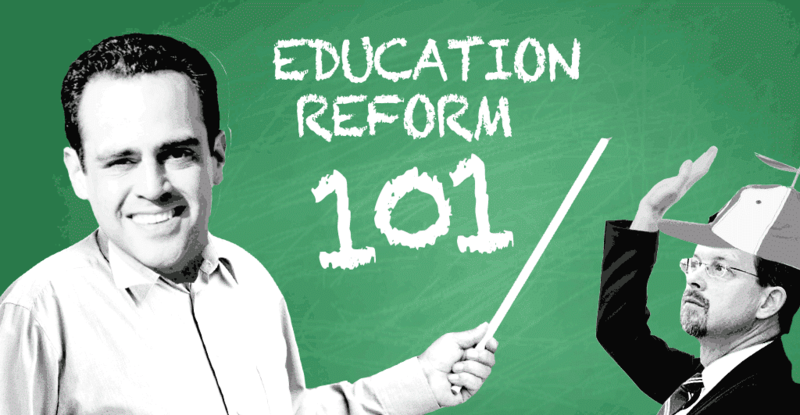 "I think in actual practice, the end legislation essentially will do neither." Smith says he stands by Act 46, though he adds, "As with any major piece of legislation, there are going to be things we're going to need to tweak." "Here's the thing: If you've been in the mix, you've had to make tough decisions and you've had to lead," Smith says. "It's easier to be on the outside and criticize what's been done. It's harder to be on the inside and move things forward." Fair point, though "Mr. Insider" isn't exactly the best campaign slogan. Minter, the third Democrat in the race, appears to be positioning herself between her two rivals. In an interview with Seven Days last week, she said she "support[s] the goals of Act 46" but is "concerned" about the spending caps. Not long after the interview ended, she called back to strike a tougher tone. "There really are a lot of issues that are potentially unintended consequences of the bill that the legislature is going to have to review," she clarified. Shumlin's spokesman, Scott Coriell, didn't respond to a request for comment on Dunne's remarks, but his secretary of education, Rebecca Holcombe, defends the law. Its "single biggest contribution," she says, has been "forcing us all to have hard, incredibly important and long-overdue conversations" about the future of education in Vermont. At least 46 local committees are meeting to discuss consolidation options, Holcombe says, and she expects a handful to take advantage of the fast-track incentives in the coming months. Just weeks ago, she notes, Essex, Essex Junction and Westford became the first towns in the state to submit a consolidation proposal under the new law — promising $1 million in savings over the course of five years. "I would say this bill's not even, what, six months old?" Holcombe says. "I think it's a little premature to say whether it's successful or not. Let's give it time to work." It's also probably a little premature to say how the politics of Act 46 will shake out. While the law's uncertainties have generated many a heated headline, new data out of the Castleton Polling Institute indicate that Vermonters aren't ready to storm the Statehouse with pitchforks. Asked whether they support Act 46, described as "state actions to encourage school districts to merge for operational efficiencies," 59 percent said they did, while 28 percent said they didn't. Of course, those numbers could change quickly this fall as Vermonters confront the law's complexities in their own communities. Interestingly, Castleton found that Democrats were only marginally more likely than Republicans to support Act 46. And a similar debate appears to be germinating in the Republican gubernatorial primary. Though Act 46 "didn't go far enough," Lt. Gov. Phil Scott says, "I think it's a step forward in accomplishing something." Not so, argues Scott's sole declared rival for the GOP nomination, retired Wall Street banker Bruce Lisman. He says the law should be repealed, because, "It will increase property taxes and initiate a state-enforced consolidation policy." Like Dunne, Lisman's trying his damnedest to tie his primary rival to Shummy. "Vermont needs change," Lisman says. "If we let Gov. Shumlin, Lt. Gov. Scott and the usual group of politicians continue to do the usual thing, we'll continue to get the usual results." Sen. Bernie Sanders (I-Vt.) has had little trouble talking rank-and-file Democrats into supporting his surging presidential campaign. He's now the — wait for it — front-runner in Iowa and New Hampshire, and he's holding his own in national polls. But, no surprise, the guy who penned a memoir called Outsider in the House is having trouble courting the insiders who play a major role in selecting the Democratic nominee. Of the nearly 4,500 delegates who will cast a vote at next July's Democratic National Convention, an estimated 713 of them are so-called "superdelegates" — party muckety-mucks who can vote however they please. And according to Bloomberg's Mark Halperin and Jennifer Epstein, Democrat Hillary Clinton's campaign claimed last month that it had already secured more than 440 commitments from that crowd. The Clinton campaign won't confirm its delegate count on the record, but the Hill has been keeping track of the endorsements of one block of superdelegates: Democratic members of Congress. Clinton has 119 of them, while Sanders has, um, none. Well, maybe one. Though the independent senator has never served as a Democratic superdelegate before, senior adviser Tad Devine and Vermont Democratic Party executive director Conor Casey say they believe Sanders will be named one this year. Which is nice and all. But even among Vermont's superdelegates, Sanders isn't doing so hot. If both he and former Democratic National Committee chair Howard Dean are given slots, Vermont will send nine superdelegates to the convention, according to Casey. Of those, four are backing Clinton, three are undecided and two — including Sanders himself — are backing the hometown hero. Clinton's committed superdelegates include Dean, Gov. 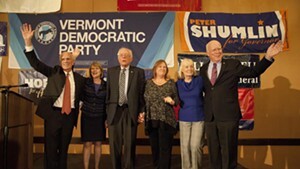 Shumlin, Sen. Patrick Leahy (D-Vt.) and national committeewoman Billi Gosh of Brookfield. "Since 1980 I've been pushing to get more women involved in politics," says Gosh, who's attended every convention since 1984. "I can just feel that maybe we're gonna do it this time." Vermont's undecideds include VDP chair Dottie Deans of Pomfret and vice chair Tim Jerman of Essex Junction. Both traveled to the New Hampshire Democratic Party's state convention last weekend and say they walked away impressed with both candidates. "Hillary was awesome. I was very, very impressed by her speech," Deans says. "Bernie was great, as always." Perhaps staying neutral for now is wise. Both Deans and Jerman face reelection to their posts in November. If they backed one of the presidential candidates too soon, supporters of another could try to topple them. Then there's Congressman Peter Welch (D-Vt.), the highest-ranking Democrat in Vermont to avoid endorsing. "I have believed from the beginning that this campaign was going to take some surprising twists and turns. I want to see it develop," he says. "I have immense respect for Bernie. I have immense respect for Hillary, too, and [Vice President Joe] Biden." Why wait to weigh in? It's not like Welch doesn't know his options. Dude ran in the same congressional race as Sanders in 1988, endorsed him in 1990 and has served alongside him since 2006. "In '90, the real question was whether the Democrats were going to run somebody and make it a three-way race," Welch explains, referring to the year the independent beat Republican incumbent Congressman Peter Smith. "I thought that was a very bad idea." Is Welch just being politically cautious? After all, Shumlin got slammed for his ill-timed endorsement of Clinton just days before Sanders announced his candidacy. "I would say 'respectful,'" Welch clarifies. "If anything, when you look back at the timing of [Leahy's and Shumlin's] endorsements, the quote-unquote 'safe' decision was to endorse the 'inevitable nominee.' And I didn't do that. So I would say it's respect for the voters." Sanders has picked up one Vermont superdelegate other than himself: Democratic committeeman Rich Cassidy. The Burlington lawyer says he wrote Sanders nine months before the senator announced, urging him to join the race. "I am absolutely delighted he's willing to take this challenge on," Cassidy says. "I think his effort is tremendously important, and I could not be more supportive." Is Clinton's superdelegate lead insurmountable? According to Halperin and Epstein, "Barring some major scandal or controversy, and given Hillary and Bill Clinton's long-standing ties to Democratic Party elites, overcoming her superdelegate edge would be quite a challenge" for Sanders or Biden, the latter of whom hasn't said whether he'll run. But Devine, Sanders' senior adviser, argues quite the opposite. "They can say they've got everybody, as far as I'm concerned," he says. "I don't view that as a real obstacle, because if Bernie does really well and wins with the voters, the pressure on superdelegates to step back from the process is going to be enormous." Devine notes that Clinton had a hefty superdelegate lead over Barack Obama eight years ago, but the party eventually coalesced around the guy who won more delegates at the ballot box. "I do wish we had 800 superdelegates right now," Devine says. "That would make it easier. But that's never been the path for Bernie." Correction 9/23/15: An earlier version of this story said Act 46 was passed in June. In fact, it was passed in May and signed into law in June. The original print version of this article was headlined "The Education of Matt Dunne"